The risk to container shipping from US-led trade wars is currently low, but potentially very damaging, according to the latest edition of the Container Forecaster published by global shipping consultancy Drewry. “In the March report we said that we were hopeful of a peaceful resolution, but at this point in time we must accept that tariffs are going to become a reality. The only question now is: how severe will they be?” said Simon Heaney, senior manager, container research at Drewry and editor of the Container Forecaster. 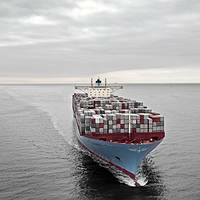 The outlook for the container shipping market in 2018 and 2019 is a combination of healthy demand growth that will outpace the fleet; resulting in a better supply-demand balance and slightly higher freight rates and profits for carriers, according to the latest edition of the Container Forecaster published by global shipping consultancy Drewry. 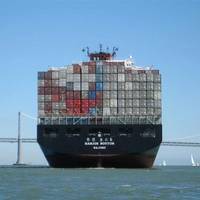 “The bad news for carriers is that they are unlikely to see the very strong demand growth rates of early 2017 for the foreseeable future. Ocean carriers achieved a six-month high for liner service reliability in May, according to Carrier Performance Insight, the online schedule reliability tool provided by Drewry Supply Chain Advisors. The on-time average of 76.0% for the 10 trades covered was a 4.1 point improvement on April, representing the third straight month-on-month rise. Along with the better on-time performance so to there was an improvement for the average deviation from the expected arrival at port, which came down from 0.9 days in April to 0.8 days in May, the lowest it has been since December 2015. Ocean carriers bucked a five-month downwards trend by improving container service reliability in March, according to Carrier Performance Insight, the online schedule reliability tool provided by Drewry Supply Chain Advisors. The average on-time performance in March gained 5.5 points against February to reach 68% with an average deviation from the expected arrival at port of 1.0 days. The improvement seen in March was expected as services returned to closer to operational normality after Chinese New Year in February when carriers tinkered with ever more void sailings to mitigate weaker demand. 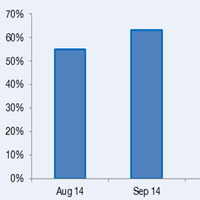 Containership reliability was broadly unchanged in November as the average on-time performance across all trades slipped by just 0.8 percentage points against October to 77.2%, according to Carrier Performance Insight, the online schedule reliability tool provided by Drewry Supply Chain Advisors. Six of the 10 trades covered recorded month-on-month on-time improvements in November, but worse performances in each of the three East-West trades and in the Asia-South America route – the only North-South trade to decline – dragged down the overall reliability performance. Containership reliability was broadly unchanged in November as the average on-time performance across all trades slipped by just 0.8 percentage points against October to 77.2 percent, according to Carrier Performance Insight, the online schedule reliability tool provided by Drewry Supply Chain Advisors. Six of the 10 trades covered recorded month-on-month on-time improvements in November, but worse performances in each of the three East-West trades and in the Asia-South America route – the only North-South trade to decline – dragged down the overall reliability performance. Containership reliability took a small step backwards in October as the average on-time performance across all trades reached 77.9%, according to Carrier Performance Insight, the online schedule reliability tool provided by Drewry Supply Chain Advisors. The latest result is based on reliability across 10 deep-sea container trades, instead of the three East-West trades as was previously measured up to and including September 2015, when the aggregate on-time result was 79.9%. The expanded coverage is part of an upgrade to Drewry’s Carrier Performance Insight, which now covers 69 ports and 809 port pairs, and also includes new functionality to download data from the monthly release in both Excel and PDF formats. 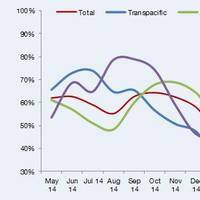 Breaking a run of six consecutive months of improvement, container service reliability across the three main East-West trades declined in July, falling by 4.0 percentage points from June to 73.3%, according to Carrier Performance Insight, the online schedule reliability tool provided by Drewry Supply Chain Advisors. The latest overall monthly performance was the result of lower reliability scores in the Asia-Europe and Transpacific trades, although service punctuality for the far smaller Transatlantic route was raised to a new data series high. 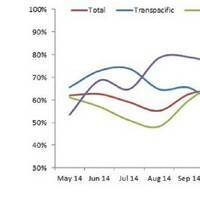 The slowdown in China’s economy poses some risks for container shipping, according to Drewry Maritime Research. According to a new report from Drewry Shipping Consultants Ltd, the risks from a slowdown in Chinese consumption to container shipping are far smaller than for the dry bulk sector, but they are not inconsiderable and will contribute to slowing world box growth. Container-shipping lines, already concerned about demand from struggling economies in Europe and many emerging markets, can now add China to their list of problems. 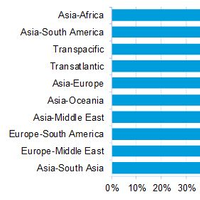 Transport consultant Drewry’s Carrier Performance Insight (CPI) for April records 67.6%, up by 4.1 percentage improvement on the previous month in the aggregate reliability of ships on the main Asia-Europe, transpacific and transatlantic trades. The previous best since Drewry’s new data series started in May 2014 was achieved in October last year (64.3%) after which the industry struggled to cope with heavy port congestion on the US West Coast and the implementation of new alliance partnerships and services. Container service reliability reached a data-series high in April with the aggregate on-time performance for the three key East-West trades rising to 67.6%, up by 4.1 percentage points on March, according to Carrier Performance Insight , the online schedule reliability tool provided by Drewry Supply Chain Advisors. The previous best since Drewry’s new data series started in May 2014 was achieved in October last year (64.3%) after which the industry struggled to cope with heavy port congestion on the US West Coast and the implementation of new alliance partnerships and services. 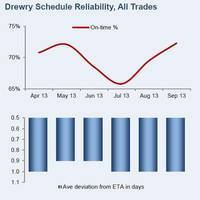 According to Drewry Supply Chain Advisors, liner shipping service reliability on the three East-West trades showed an aggregate on-time performance of 64% in March - a five-month high. According to Carrier Performance Insight, the online schedule reliability tool provided by Drewry, this was 8.5% up on the February figure - and the second best aggregate since the new data series begun last May. The latest result represents an 8.5 percentage point gain over February and is the second best average (after October 2014) since the start of the new data series in May 2014. The on-time percentage of liner services improved slightly in February, but the ships that missed their berthing window missed it by a wider margin due in large part to labor strife at West Coast U.S. ports, according to this month's Carrier Performance Insight from Drewry. 55% of ships in the three key East-West trades arrived within +/- 24 hours from the advertised ETA, up 6.6% against January’s historic low of 49%. The average deviation from the ETA to actual arrival, however, extended from 1.9 days in January to 2.1 days in February. 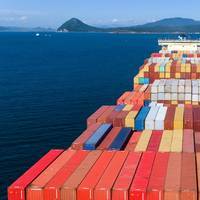 Drewry Maritime Research says it is hosting a free webinar for supply chain professionals to explain recent trends in ocean & air freight rates and provide an outlook for the future. The event will be hosted by Simon Heaney, Senior Manager, and Philip Damas, Director Drewry Supply Chain Advisors. Both executives will be available to take questions following a 20 minute presentation. 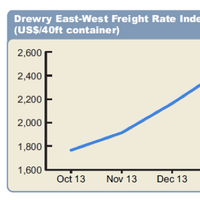 This analysis will be provided by reference to information available in Drewry's Sea & Air Shipper Insight report. Following three consecutive months of price rises, freight rates on the East-West trades declined in February, according to Drewry’s online Container Freight Rate Insight. Rates came under most pressure on the Asia-Europe trade, which weakened following a meteoric rise in the run-up to the Chinese New Year. Drewry’s Asia-Europe Westbound Freight Rate Index dropped 12% in February to $2,992 per 40ft container, while weekly data from the World Container Index assessed by Drewry indicates that the pricing erosion has continued into March. Drewry’s Carrier Performance Insight report, just published, revealed a disappointing drop in performance for both ship-level and container-level reliability Key Performance Indicators (KPIs) in the third quarter. Containership reliability dipped below 70% for the first time since the beginning of 2012 as weaker performances in the Asia trades to and from Europe and the Middle East/Indian Subcontinent contributed to a quarter-on-quarter decline of 1.4 percentage points to 69.5%.